When planning a trip to Hong Kong, visiting one of the small fishing villages outside the city is a great way to experience local culture and take in some of the natural beauty of China and the surrounding area; chief among them is the small village of Tai O.
Tucked away in the greenery of South Lantau, transportation to Tai O is available by ferry or bus. Practically, the best way to get to Tai O is to take the Hong Kong Mass Transit Railway (MTR) to Tung Chung Station and then the number 11 bus from Tung Chung Town Centre for a total journey of a little over an hour, if the connections fall into place. Alternatively, the ferry from the Central Ferry Pier (in front of the IFC Mall) connects to Mui Wo on Lantau Island, where you can catch the number 1 bus from the bus terminal to the village. While slightly slower, the ferry connection offers great panoramic views of Lantau and Hong Kong Island while you make your way to the fishing village. You can also take the MTR to Tung Chung Station Exit B. Take the Ngong Ping Cable Car to Ngong Ping Village (approximately 25 minutes). Then board bus 21 to Tai O terminus (approximately 20 minutes more) and walk for five minutes to the rope-drawn ferry. 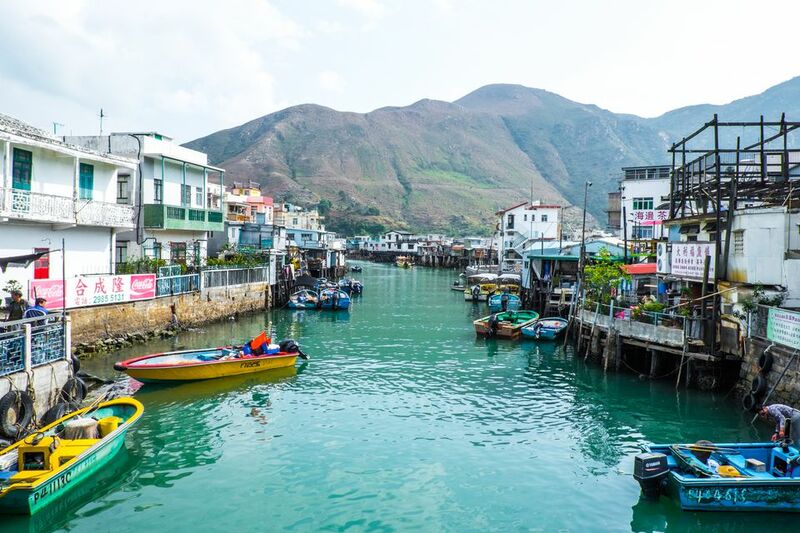 Like most small fishing towns near Hong Kong, Tai O operates at a much slower pace, which offers tourists a chance to escape the neon lights and towering buildings of the city. The lifelong residents of Tai O, known as the Tanka people, keep busy fishing and tending to work around the village, and according to a 2013 article on CCN, "tourists have been flocking to Tai O to glimpse this part of Hong Kong's rapidly disappearing past." However, the few shops in town close by 5 p.m, and there's no real nightlife here, so it's not a destination if you're looking for that type of adventure in Hong Kong. Other nearby areas of interest include the newly-constructed Tai O Promenade, the Tai O Market, the Kawn Tai Temple, and the Nga Kok Church, as well as the signature stilt houses the Tankan people built along the Tai O River. You can also stay at the Tai O Heritage Hotel, a 1902-constructed police station that was converted into its current form in 2012, featuring nine colonial-style rooms and suites and a rooftop restaurant serving local cuisine. As of 2011, the population of Tai O was roughly 2,700 people, and according to archeological data, permanent settlements have only existed in the area for roughly three hundred years, dating back to the early 16th century. Due to its location at the mouths of the Tai O Creek and River where they meet the South China Sea, the small town of Tai O has served as the base for multiple military and smuggling operations throughout its history. A military base was constructed in the 1720s to protect shipments on the Pearl River, and reports of stolen tobacco and guns into and out of mainland China persist to this day. From the 1800s through the 1930s, British occupation changed much of the cultural landscape of this small village, including its name (formerly Tanka) to its current Tai O. Also, after the Chinese Civil War in the 1940s, Tai O served as a major port-of-entry for illegal immigrants fleeing the Chinese government at the time, many of which integrated seamlessly into the existing culture of the village. As time moved on and industrialization and modernization of Hong Kong continued to change towns and communities around Tai O in the last half of the 20th century, the village remained relatively unchanged. Salt was harvested, fish were caught, and new homes were built, but residents who were born there often left Tai O when they came of age. In the early 2000s, a large fire damaged a majority of the stilt houses in Tai O, leaving much of the community decimated. However, a 2013 project by the Hong Kong government that sought to revitalize this dying fishing village constructed a new promenade and began developing the town to try to breathe new life into it. There once was a manually operated drawbridge spanning the narrow creek dividing the town but that has been replaced a rope-drawn "ferry" that has operated for over 85 years. While many of the traditions of the past are still celebrated to this day, many in Tai O fear its culture will soon die out as real estate development comes in and more local college students move away to find work in other parts of the city. Can I Bring My Pet to Hong Kong?